Wilson W. Crook, III is an Affiliated Researcher with TARL. This article is part of the March 2018 TARL Newsletter. 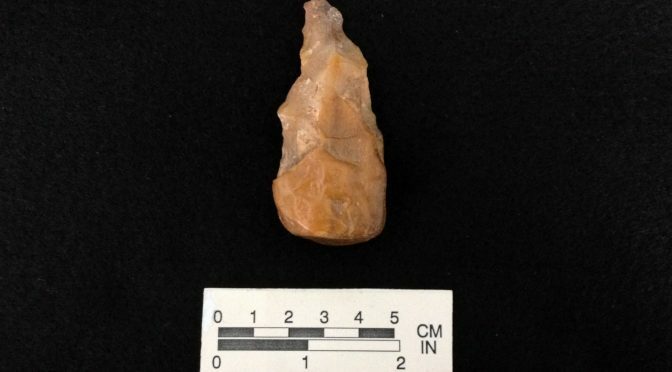 During our recent work with the Andy Kyle Archeological Collection on behalf of the Sam Houston Regional Library and Research Center in Liberty, Texas, a number of unique bifacially flaked artifacts were observed from sites near the Trinity River in Liberty County (Crook et al. 2017). These artifacts were constructed from small, oblong cobbles that retained their original shape on the proximal end but had been bifacially flaked on the proximal end to form a sharp, tapered point. Similar tools have been recovered from sites within the McGee Bend (now Sam Rayburn) Reservoir in the mid-1960’s (Jelks 1965, 2017). Jelks named the artifacts “Perkin Pikes” but noted that this was a temporary designation as their true function was unknown. As a result, a study was undertaken using high power digital microscopy in an effort to observe use wear patterns which might help determine the tool’s true function. In a detailed study of 13 sites prior to the construction of the McGee Bend (Sam Rayburn) Reservoir, Ed Jelks noted the occurrence of 121 artifacts which he termed “Perkin Pikes”. The artifacts were constructed from relatively small (<100 mm) oblong river cobbles. The most common lithic material was chert but cobbles of other materials (quartzite, silicified wood) were also used. Many of these cobbles were rectangular in cross-section. In each case, the proximal end of the cobble was left unmodified while the distal end was bifacially flaked to form a tapered point. Dimensions for artifacts made from chert ranged from 28-72 mm in length, 19-41 mm in width, and 10-23 mm in thickness. Jelks did not make an attempt to determine the artifacts’ function, stating that the term “Pike” was simply used to describe the tools’ tapered point (Jelks 1965, 2017). Perkin Pike-like tools were also described by Tunnell (1961) from McGee Bend, by Wheat (1953) from Addicks Reservoir in Harris County, and by Jelks (1962) from Texarkana Reservoir. Table 1. Physical Measurements of the Perkin Pikes from the Andy KyleArcheological Collection from sites in Liberty County, Texas. Average length:width ratio = 2.09. Average length:thickness ratio = 3.04. In our study of the 30,000+ piece Andy Kyle Archeological Collection, a total of 15 tools were identified which seemed to be identical to Jelks’ Perkin Pikes. The artifacts were found in collections from four sites in Liberty County including Wood Springs (41LB15), Savoy (41LB27), Knight’s Bayou (41LB61), and Moss Hill (41LB65). Eleven of the artifacts were constructed from chert cobbles, two from quartzite and two from silicified (petrified) wood (Table 1). Size of the artifacts was fairly consistent with lengths ranging from 55.5 – 77.6 mm; widths from 28.8 – 38.0 mm; and thicknesses from 14.2 – 25.7 mm. 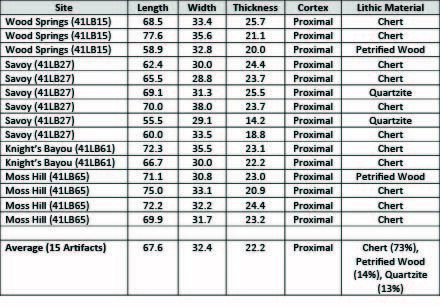 Average tool dimension was 67.7 x 32.4 x 22.2 mm (see Table 1). Average length-to-width ratio is close to 2:1 and average length-to-thickness ratio is near 3:1. All of the artifacts had a rectangular cross-section with the cobble’s original cortex remaining on the proximal end to about one-third the length of the cobble. The distal end was bifacially flaked into a crude point. An example of a typical Perkin Pike from the Moss Hill site is shown in Figure 1.
site in Liberty County. Note the presence of cortex on the proximal end of the tool. Seven of the artifacts were examined under high power (20-220x) using a Dino-Lite AM-4111-T digital microscope. Several of the specimens showed a high degree of polish on the proximal end of the artifact on the cobble cortex. This sheen is consistent with the tool having been hafted while in use (Keeley 1980). On the distal end, five of the artifacts showed some polish on the tip of the point. This polish was present only on the distal end of the point and not on any of the lateral edges extending back from the point toward the unmodified proximal end. Detailed examination showed the polish to extend around the circumference of the distal end, consistent with wear from a rotary motion on a material such as leather (Keeley 1980). It is therefore suggested that the Perkin Pikes examined from the Liberty County sites were used as a perforator type tool. The Perkin Pike is a minor but consistent component of the Late Prehistoric occupation in sites from Liberty County. The 15 artifacts observed from the Andy Kyle Archeological Collection are consistent in size and composition to those described by Jelks (1965, 2017) from sites in the Angelina River drainage now submerged beneath Sam Rayburn Reservoir. 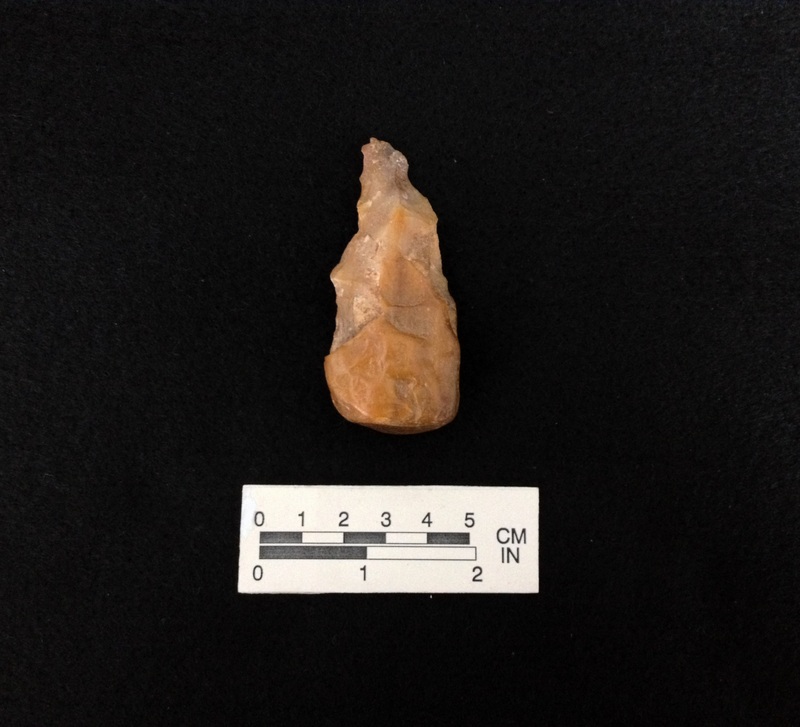 As noted by Jelks (2017), chert cobbles were the preferred lithic material for manufacturing Perkin Pikes although examples are known both from Sam Rayburn Reservoir and from the Kyle Collection from both silicified wood and quartzite. Workmanship is limited with only the distal end of the cobble being flaked to a bifacial point. Microscopic examination shows polish developed on the unmodified dorsal and ventral surfaces of the proximal end which is indicative of the tool having been hafted during use. Rotary polish was observed on the distal tip on several specimens from the Kyle Collection suggesting the tool was used on material such as leather. As such, the Perkin “Pike” might be better defined as the “Perkin Perforator” and used by the aboriginal inhabitants of Southeast Texas as a specialized tool for the manufacture of leather (probably deer skin) goods. 2017 The Andy Kyle Archeological Collection. Report of the Houston Archeological Society, No. 29:13-56. Houston. 1962 The Kyle Site: A Stratified Central Texas Aspect Site in Hill County, Texas. University of Texas Archeological Series No. 5. 1965 The Archeology of McGee Bend Reservoir, Texas. Unpublished Ph.D. Dissertation. Department of Anthropology, The University of Texas, Austin. 1980 Experimental Determination of Stone tools Uses: A Microwear Analysis. University of Chicago Press, Chicago. 1961 Evidence of a Late Archaic Horizon at Three Sites in the McGee Bend Reservoir, San Augustine County, Texas. Bulletin of the Texas Archeological Society 32:123-158. 1953 River Basin Survey Papers No. 4: Archeological Survey of the Addicks Dam Basin, Southeast Texas. Bureau of American Ethnology Bulletin 154. Washington, D. C.